I hadn’t planned on taking a bike that I had only bought one week before on such a trip, but the Concours ZG1000 begged me to buy it and in the week before the trip I had not only bought it but sold my trusty old Honda CB450T. This added a level of uncertainty to the trip that brought about new levels of excitement, and not in the best way. 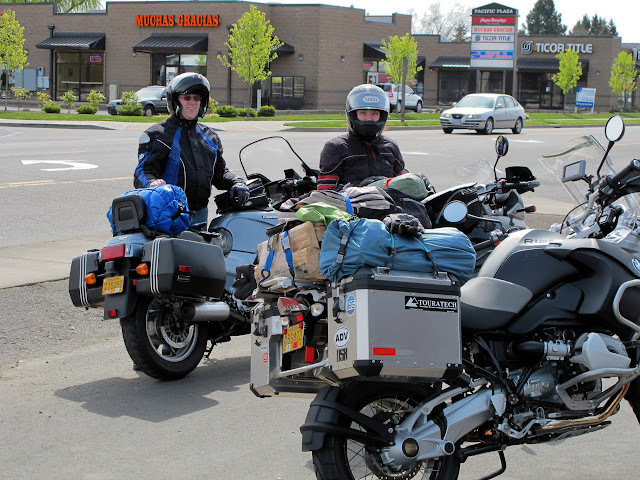 We started off with breakfast at Genie’s in Portland and then headed down the back roads to below Eugene on 99W going south. Traffic was hell going out of town and it felt really good to get past McMinnville where actual miles could be put down. Right around parallel with Eugene on 99W we had a quick debate of where we were headed, a studying of maps and GPS and headed on our way. Well, the GPS sent us somewhere odd that wasn’t on the Google Maps printout and we used a physical map to get us on track to Crow, OR. After getting onto the roads that lead to BLM road 36 the roads got tighter, corners deliciously twisty and I had to get used to my heavy new bike in a hurry. We kept a good pace into the forested hills. Shortly after passing a forest prison work camp (who would have known?) we came to a wood carved and painted map that didn’t seem to agree with anything I had printed out from Google Maps. After using a trusty folded map and comparing it with a GPS we took a left and proceeded up the amazingly twisty road to the summit there. This BLM did tend to keep you on your toes, perhaps doubly so in spring. There were a couple times we came around the corner to find a partially covered road with a fallen tree or a landslide. There was also a fair amount of moss growing on the road and I was certainly glad that it wasn’t raining for that part of the trip. We made it up and over the summit without incident. Where the ground leveled out again (about half way along the route, 35 miles or so from any town) we made a quick stop for some pictures and for the two people riding BMW GS bikes to romp on a muddy road. After starting up again we came around a corner to find a guy in full black leathers wrestling with a red Suzuki Intruder that had a stuck throttle. We stopped to see if he needed help, checked out the situation and found that the throttle grip appeared to be partially broken and wouldn’t return to idle correctly. I hacked together a fix with a broccoli rubber band that I had randomly brought attached to his throttle plate and he was able to have it return to idle again after a revving. He seemed anxious to go (never even caught his name), and wanted to go the opposite direction we were headed. He asked what he owed us, I said how about a handshake and wished he had a safe travel back and he rode off. I really hope he was able to limp that bike back the 35+ miles to Eugene. The rest of the ride down the BLM road was fairly uneventful. We made a stop for some pretty waterfalls and a couple pictures. About 10 miles out of Reedsport it started to sprinkle. By the time we got to Reedsport proper it was a decent rain. We made the decision to get dinner in the dry and then hunt down some place to camp. This proved to be a good decision as the rain let up while we ate and there were only wet roads to the first open campground we were able to find: Tihkiwama Lake. Camp was setup and the realization occurred that it was only 6:30pm or so and there were many more hours of hanging out to be had. I popped back into Reedsport for a 6-pack of IPA. This proved to be a very wet decision though, as it rained the entire ride there and back, hard. I arrived back to camp with a 6-er and huddled around the campfire. Though we were under a heavy tree canopy the rain finally won and doused our fire so we then sought refuge in one person’s tent and talked for a bit before going to sleep. I woke up early, like 6:30am early and couldn’t go back to sleep. The yellow tent I was in blazed like seven suns. I prepared for a rainy day of riding with silk long underwear, wool socks, long sleeve shirt and a wool sweater under all my usual gear. I was packed and rearing to go again. The sky was overcast but the clouds were high, as were the hopes of the riders for a rainless riding day. We headed out and went a bit north before stopping for breakfast in a small town that I can’t remember the name of. We agreed that if it was raining by the time we hit Tillamook that we’d shortcut our ride and head back on highway 6 instead of 53 like we had planned. The ride up 101 was great. There wasn’t that much traffic and we ate up the miles. The pavement was mostly dry and the bikes hummed with the passion for coastal corners and passing lanes. Just shy of Tillamook we were at about 120 miles for the day so far. I was leading and made the executive decision to pull off at one of the only rest areas I had seen the whole trip. After a nice stretch and chat about the route and weather, we decided to head up to Nahalem, have lunch and then soak up some highway 53 lovin’. With an interesting lunch at the cafe downtown in Nahalem, and served by the 2010 Tillamook County Dairy Princess, we headed out to gobble up highway 53. This was the first time any of us had been on this road so the pace was spirited but safe. There is nothing as lovely as seeing a sign at the start that warns of extreme corners for the next 12 miles. There was a pack of sportbike riders headed down the hill as we were headed up. Other than that there was basically no traffic. We tootled back on highway 26. I found myself trying to make sure I stayed focused. It’s easy to let you mind start wandering once you get back on familiar roads. Plus I was really sore. This bike is about 250 pounds, 550cc and 2x as much HP as my old bike. The riding position is also a bit lower on the bar end. I may need to make some modifications to the bars, we’ll see. The rest of the ride back on 26 was uneventful, however there were a couple spirited passes in the passing lanes. Then with a silent mimed wave to my fellow riding companions I pulled off and rode my steed into the garage in Hillsboro. 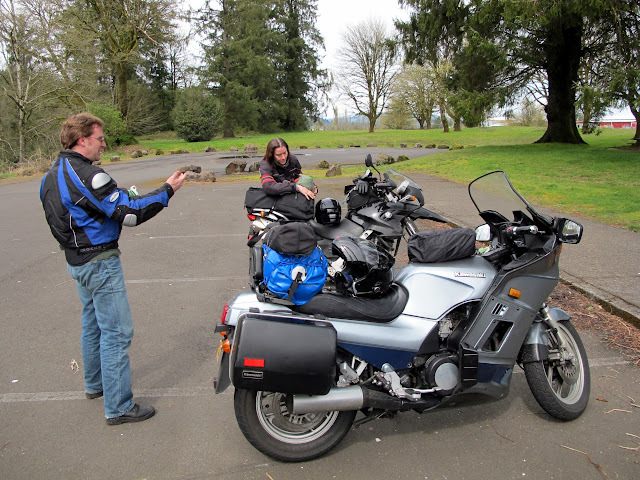 This entry was posted in Motorcyling, Travel and tagged adventure, motorcycle, Oregon, Reedsport, ride, twisties. Bookmark the permalink.